Checkboxes Control allows capturing multiple selections among a set of options. If you want to capture only one selection of options, check out Radios Control. Using an internal or external data list as the source to populate the list of available options. This functionality is available in Advanced and Ultimate plan. To add the checkboxes control to your form, simply drag and drop it from the control panel to the form-design area. To adjust the properties specifically for checkboxes, click on OPTIONS tab on the properties panel below the control. Similar to radios control, the checkboxes control allows specifying the number of options per line. The minimum number of options per line is one (1) and the maximum number of options per line is four (4). 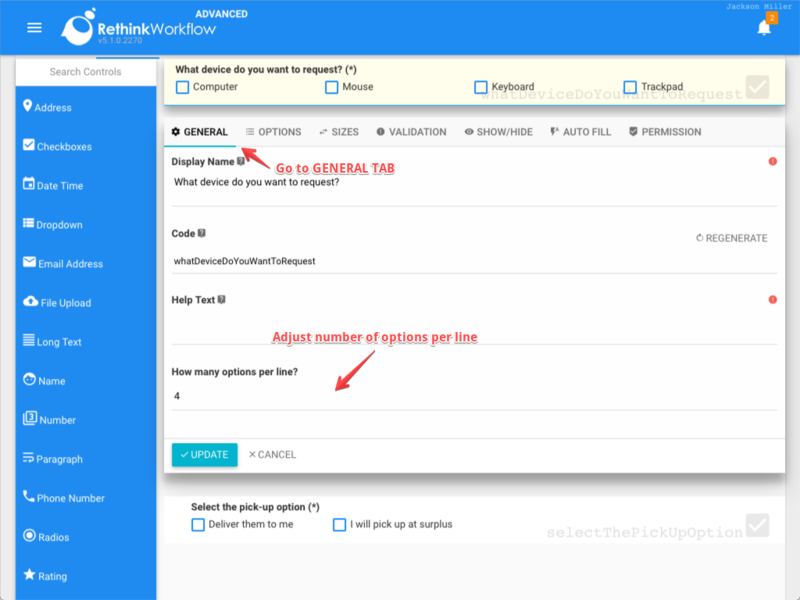 To use this setting, click on GENERAL tab and adjust "How many options per line?" Defining options for checkboxes is similar to radios control. The animation below demonstrates how the end-user interacts with a radios control, but the checkboxes are similar. To filter documents using the checkboxes field, click on FILTERS and select it from the list of filters. On the address filter popup, select the values for filtering.